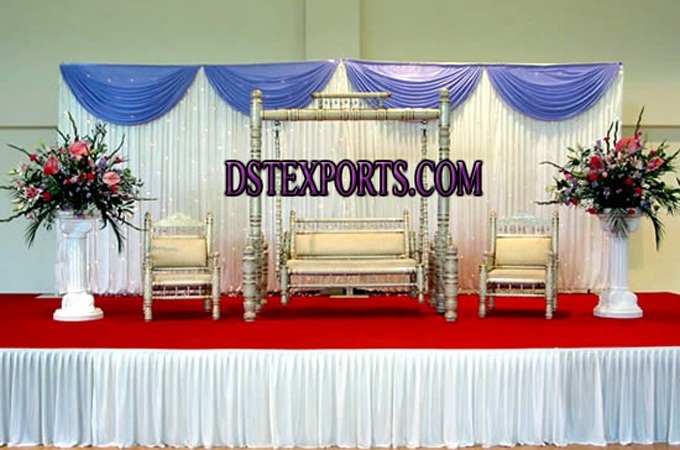 We are manufacturer and exporter all types of wedding jhula wedding swing and all types of handicraft decorations Wedding swings are made of treated wood with excellent quality deco paints hand carvings These handicrafts are elegant and classic. They are perfect to beautify the decor of your wedding or home . wedding swing jhula wedding wooden carved swing jhula vivaah jhula silver metal jhula swing golden metal jhula swing traditional swing jhula wooden sankheda swing with matching chairs sankheda jhula wedding jhula with roof antique wooden swing jhula wedding mandap jhula swing royal wedding swing jhula for bride groom Indian wedding swing jhula wedding stage jhula swing These are Very common in Indian Wedding Ceremony, as wedding furniture and wedding decoration These swings are very beautiful and attractive as these are made by our well-trained professionals using high-grade materials. The swings offered by us are well cushioned and covered with attractive fabrics and other embellishments. We are able to offer the Sankheda Swing in many sizes and designs as per the requirements of our customers.